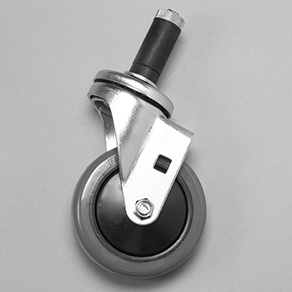 Stem casters are designed to fit the I.D. or either 28mm or 42mm Creform pipe and secured by expanding rubber mandrels. The exception being one caster style that is press fit and tapped into the end of Creform 28mm pipe and secured with self-tapping screws. 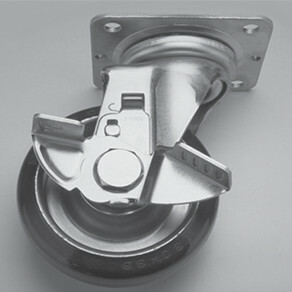 Creform offers several bolt-on style casters that mount directly to pipes of structures using the mating reinforcement metal straps found in the accessories section of the Creform catalog. Some are used for manually pushed/pulled carts or dollies with others can also be used with motorized vehicles. One style of these casters are designed to ride rails fabricated from Creform 28mm pipe and the other for use with synchronous carts. Both are bolt-on style casters.